Michael McIntyre has become Britain’s biggest comedy star. His debut stand-up DVD was the fastest selling of all time, only to be eclipsed by his second that sold over 1.4 million copies. He hosts his own BAFTA nominated BBC1 series, Michael McIntyre’s Comedy Roadshow, and won the British Comedy Award for Best Live Stand-up in 2009 following his record breaking fifty-four date Arena tour. 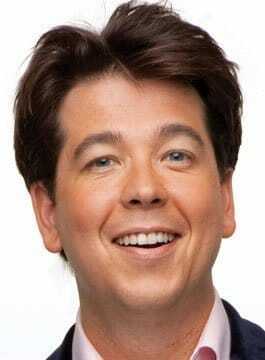 Michael McIntyre is a skilled performer. Taking comedy to a new extreme, he makes the art of good gags look effortless. Anxious to keep the audience involved, he sets as much store by improvised interaction as by carefully prepared material. Michael’s big break came at the Royal Variety Performance in 2006. In 2010, Michael won the British Comedy Award for Best Male TV Comic. In the same year, he became the youngest ever host of The Royal Variety Performance and released his bestselling autobiography, Life and Laughing. Michael continues to perform to sell-out arena audiences with his stand-up show.